A leadership change in the House could mean a shift in policy priorities, but if you're a long-term investor, other factors such as earnings and interest rates may be larger concerns. 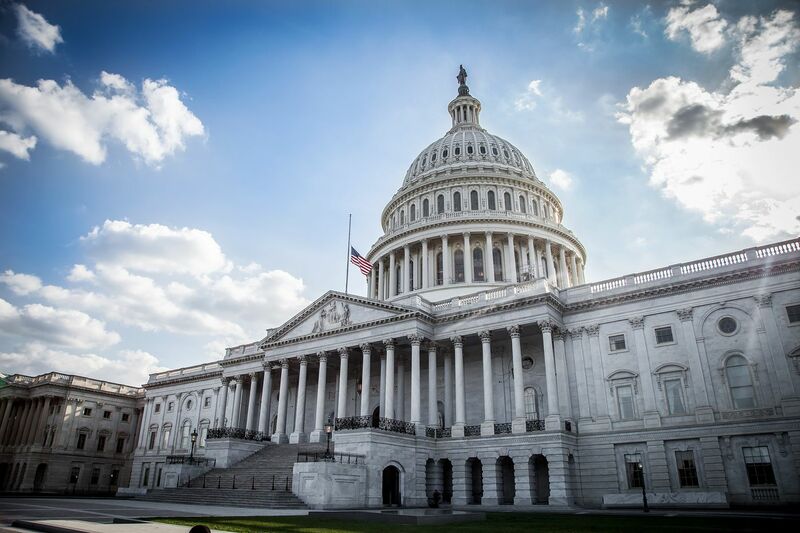 The midterm election results are in, and with them comes a list of policy issues that might be taken up when the new Congress convenes in 2019. Taxes, infrastructure, health care, financial regulation, drug prices, international trade—could be among the top candidates. None of them are likely to be answered right away, but any or all could potentially affect the markets. While a divided Congress has historically been associated with rising stock values, the way they approach these major issues could help some sectors and hurt others in the coming months. Still, long-term investors might want to consider caution as they assess the election. Other issues that affected the market over the last few months, including trade with China, a possible earnings growth slowdown, rising interest rates, and a stronger dollar, haven’t gone away, and could ultimately have as big or even a bigger impact. With all this in the mix, volatility remains a possible factor. While it’s still early, long-term investors might want to keep their eyes open for signs of possible bipartisanship around health care and infrastructure. Any signal that Congress can work across the aisle, and possibly with the White House, could bode well for some sectors and potentially fixed income as well. Though markets initially rallied after the election, a wholesale change in sentiment seems unlikely, considering so many issues remain in flux. “Let’s wait and see what happens here over the next two months,” said JJ Kinahan, Chief Market Strategist, TD Ameritrade. “People are trying to figure out where we go, and a lot of fund managers have had a good year— they don’t necessarily want to risk it in the last two months of the year.” Big financial firms might not be planning on any major changes to their allocations until they have more certainty on some of the issues discussed above. On a positive note, a divided Congress “is usually good for markets,” Kinahan added. The S&P 500 has yielded an average return of 15.3% in the 6 months after midterm elections, according to S&P Capital IQ, and the index has historically seen an average gain of 7.5% in the fourth quarter alone. It can be dangerous, however, to expect history to repeat, especially this time with all the factors like trade and rising interest rates still in the mix. While much remains unsettled, let’s look at possible positives and negatives for stocks and fixed income in the coming months amid the new political realities, and then talk about what all this might mean for rate policy and how long-term investors might want to approach strategy. Conducting your own research? 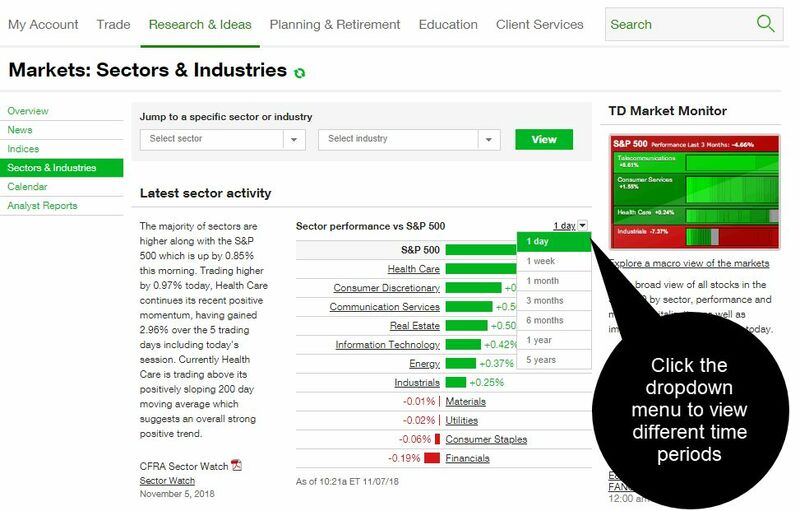 Consider starting with TD Ameritrade's Markets: Sectors & Industries analysis page (see figure 1). FIGURE 1: SECTORS & INDUSTRIES. Want a performance snapshot of the different stock sectors and industries, as well as access to market research and the latest news? TD Ameritrade clients can log on to tdameritrade.com and, under the Research & Ideas tab, select Sectors & Industries. For illustrative purposes only. Past performance does not guarantee future results. In early 2017, when President Trump took office, there was a flurry of talk about possible infrastructure spending, with figures like $1 trillion bandied around. That quieted pretty quickly, but now, in the post-election hours, it’s come up again. Sectors like materials, tech, transports, and industrials all conceivably could get a lift if Congress can get a bill put together for spending on roads, bridges, railroads, and airports. Info tech might also do well in a bipartisan environment, Kinahan said. The sector has traditionally done well under those circumstances. Outside of stocks, fixed income could benefit from the new political makeup, some analysts said. A mixed Congress probably makes further Republican tax cuts like the ones last year a little less likely. Tax cuts often increase government deficits, which can cause bond traders to unload Treasuries in fear of inflation. The idea that Democrats might keep the lid on future tax cuts might give Treasuries some support, and indeed, the Treasury market initially rallied after the election. On the other hand, if a major infrastructure bill does start taking shape, it might put pressure on fixed income. Healthcare could come under pressure, Kinahan said. A Democratic House might zero in more on pricing issues, something President Trump has also been vocal about. The president may have enough allies on this issue to get cooperation from both sides of the aisle. Health care was the top issue cited by voters in many media exit polls, and high drug prices tend to be unpopular with consumers, whatever their political party. However, healthcare stocks, along with biotechs, were among the best performers Wednesday after the election. Financials are another sector potentially in the spotlight. While the big banks might have had more problems had Democrats taken the Senate, a Democratic House isn’t necessarily good news for an industry that’s been subject to tighter regulation under past Democratic leadership. Still, a bigger Republican presence in the Senate might provide cushion. The market’s most closely-watched “fear index,” the VIX, fell to one-month lows after the election. However, volatility has returned and has been trending around a historical level of 20. A lot of events still hang over the market, including another possible Fed rate hike before year-end, Brexit negotiations, and a meeting between President Trump and Chinese President Xi at the end of November. There’s also the chance for more political fireworks in Washington as investigations might return to focus now that the election is over. Since last year, this issue at times has sent electric shocks—usually short-lived—through the market. All of these factors are likely to indicate choppiness could continue, and long-term investors might need to keep their seatbelts on and not get too focused on the day-to-day moves. Doing that can sometimes lead to rash decisions. Still, one element of uncertainty vanished with the elections. “There is likely some bipartisan relief for the bulls and the bears that the midterm election is over,” said Patrick O’Hare, Chief Market Analyst at Briefing.com. “That fact has removed an element of uncertainty, which has added to market volatility in recent weeks.” While midterm elections were a short-term driver of volatility, the path of interest rates and earnings growth has a bigger impact on both volatility and market direction over time. Markets expect the Federal Reserve to raise interest rates at least once more before the end of the year—probably at its December meeting. Chances are about 80%, according to Fed funds futures. The interest rate outlook for 2019 is mixed, but the market has priced in a likelihood of 1-2 additional hikes next year. After the election, the yield on the 10-year Treasury ticked up to about 3 ¼%. In the long-term, earnings drive markets. Q3 earnings season wraps up just as the closely-watched holiday shopping season heats up. Then the earnings cycle starts all over again in January. Whatever the election results might tell investors, they don’t change the fact that we’re in a rising rate environment and many analysts expect earnings growth to slow in 2019. Those are among the reasons the market came under pressure last month, and they aren’t out of the way. Worries about trade with China also still loom large, though it’s possible that some Republican losses in Midwest states on Tuesday might partially reflect voter frustration with the administration’s trade policy and its impact on agriculture. Whether those election losses factor into the next administration move as Trump prepares for his meeting with Xi remains to be seen, but agricultural-related stocks might be a place where any change in policy starts to get reflected. “The election results might put more pressure on President Trump to get something done with China before he loses the full support of Congress at the end of the year,” Kinahan said. For long-term investors, the midterms shouldn’t necessarily change plans for the coming months. The end of the year is fast approaching, and that’s often a good time to look at how investments performed, review portfolio goals and see if any have changed, and adjust allocations. 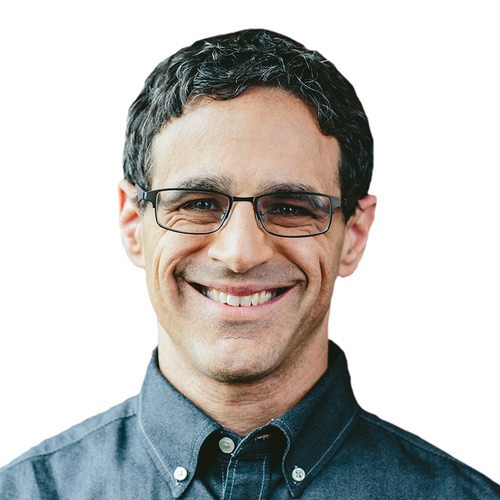 Stocks and fixed income prices have whipsawed a lot this fall, so you might want to make sure your allocation is in sync with your objectives and risk tolerance. Anyone fearing a less market-friendly Washington might want to remember, too, that, as Kinahan said, a divided Congress has often been good for stocks historically. Also, major legislative change tends to come slowly, if at all. The Fed’s next rate hike and next year’s earnings probably will have a more immediate impact on the markets than anything coming out of Congress in coming months.